Relying on the Moon is a book that invites us to think of our grief in a new way. In ways much like the phases of the moon, our grief moves through times when we're able to see through the dark, to times in which we can't make our hands in front of our faces - and back again. And like the phases of the moon, our grief sometimes feels like it's familiar, as though it is circling round once more. What is true, though, when we are able to pay attention, is that when grief returns somehow it is not the same and neither are we. My book is now available for purchase. It is $15.95 plus $4.00 shipping and handling. Please complete the information below and we will be in contact with you in order to fulfill your order. Pairing up stories with Susie Gentry's beautiful pictures and providing White Horse Exercises for reflection, this book invites you to take time and perhaps live into some new understandings of your grief. 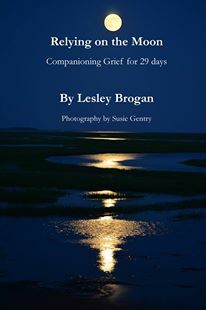 It is my hope that the stories in this book will companion you in and through 29 days as you pay attention to your grief and rely on the moon to remind you of your life stories and what you already know. At this point in the journey, it feels most important to share these books. Your price is $0. Send me your address and I will get yours in the mail (as long as I have the books to send). If you feel so inclined, it would be a kindness if you to make a donation instead to an organization of your choosing. If you have the time, I would love to hear about it. This book is written as a reflection and meditation for understanding our times of grief. I hope that my stories and Susie's pictures companion you as you are making your way through these tender days.